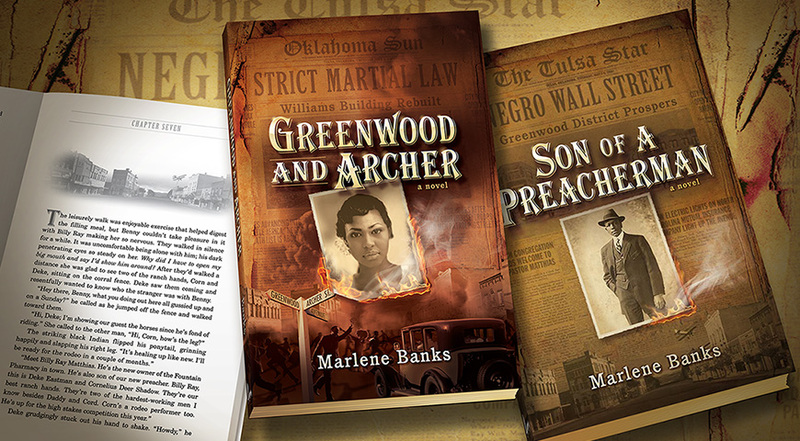 Set in Tulsa during the Tulsa Race Riots at the start of the 1920’s, the Son of a Preacherman series seeks to convey the timeless theme of trusting God at the worst of times. 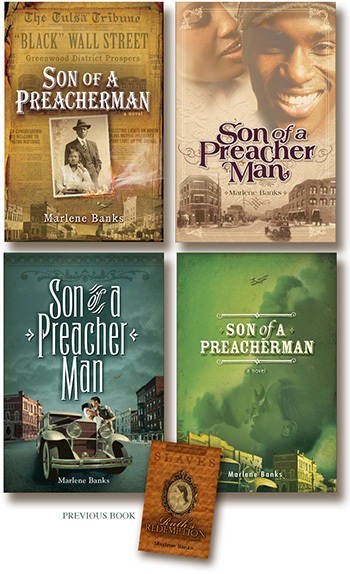 The author, Marlene Banks, has written these two new novels, Son of a Preacherman and Greenwood and Archer, which are to be the first of three books in this series by Lift Every Voice, an imprint of Moody Publishers. Design Corps was responsible for both cover designs as well as the design of the interior. We were asked in late 2011 to develop concepts for the cover of Son of a Preacherman. We started by evaluating the the visual context of the story: images and art from the 1920’s. We looked at historical archives, media, automobiles, architecture and fashion. We gathered images of printed materials to help guide our selection of fonts, colors, and style. And we also sought to distinguish between what may have been current in urban centers like New York City compared to the smaller and less urban population of Tulsa, Oklahoma. We also made sure that some of the cover concepts were visually tied to the cover of the author’s prior historical fiction novel published by Lift every Voice. The final selected design for the first book shows a man and a town that seem to have it all, but we used several elements such as fire and the low-flying biplane to hint that things were about to change. The second book in the series, Greenwood and Archer, has a cover design that uses the same type of portrait photograph element to focus upon a different character. More flame was added in the foreground to go with the scene of a city in flames and a people in panic in the background. Obviously there are not many image of such scenes of catastrophe available other than for editorial use — and none from 1920’s Tulsa that captured fire and panic in progress. Therefore, the background combines at least 19 different elements of smoke , buildings, cars, and running people to achieve the desired effect.